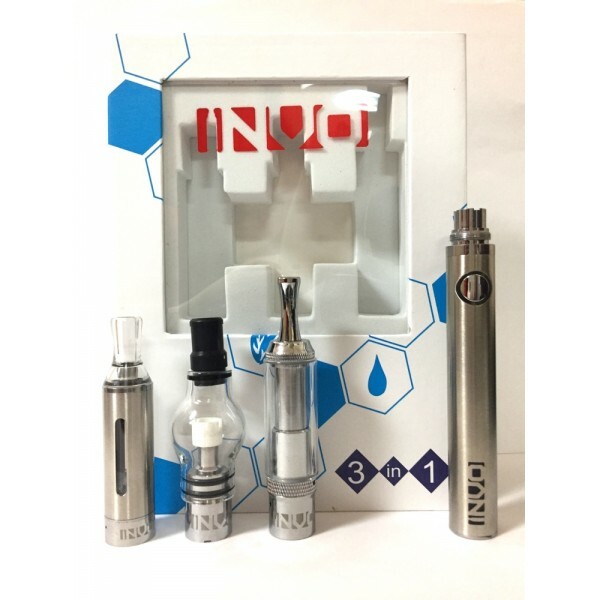 This 3 in 1 kit from INVO includes an eliquid tank, a wax globe, as well as a dry herb tank allowing for three different materials to be vaporized with a quick switch of the top. This is combo box is a combination of some of our most popular products, featuring the INVO X-Tank, INVO G-ball, and INVO eGo Battery. The INVO 3 in 1 kit is designed for the modern renaissance man. We're not talking about the kind that likes to dabble in the shisha esolids every once in a while and every other weekend they indulge in the mild tobacco blends and e-liquids... The invo 3 in 1 kit was designed specifically for the the nicotine Michaelangelos of the world. The ones who are not going to be content with the occassional mediocre shisha esolids session or the 3mg e-liquids. The 3-in-1 kits are for the people who do it all and want the best of the best, every single time! Sure, the kit contains interchangeable heads for total e-liquid, esolids and dry herb indulgence, but if these words described even only a fraction of the real, absolute enlightenment experienced every day by INVO 3-in-1 kit crusaders ('owners' just doesn't do this justice) then the world's manufacturing cababilities would not be enough to keep up with the global demand for the INVO 3 in 1 kit. Governments would be overthrown by the sheer volume demand and lack of production ability which this situation would present. Ladies and gentleman, there are some OK kits out there and some of them might sometimes get the job done, but this 3-in-1 kit is doesn't even play in the same ballpark as those kits. And for that matter, not even on the same planet. The INVO 3-in-1 kit dwells in a galaxy of its own, far beyond the limitations of our human comprehension.